Who would have thought that a vacant poolside kitchen would turn into a hydroponic garden serving fresh produce to the many Marriott customers and guests throughout the Bay area? The Tampa Marriott Waterside decided that they needed to use the vacant spaces in their hotel, and put them to good use. They developed one hydroponic garden near the pool, and a roof top garden. All produce is dispersed among the Marriott restaurants for customers to enjoy. This choice has allowed for a savings of over $1,000 a month in food cost. That is amazing! Currently they are producing 75-100 heads of lettuce which are used for salads throughout restaurants. The roof top tomato garden is hoping to stay on track by producing 160- 320 pounds of tomato from each crop. A rain harvesting irrigation system, created out of mostly recycled materials was built for the rooftop garden. Among the vegetables being grown, the hotel is growing herbs and flowers; basil, chives, mint, rosemary, thyme, oregano, marigolds, and sunflowers. Not only us the Marriott being environmentally friendly, saving money, but allowing their customers to enjoy in a healthy eating experience throughout their restaurants! 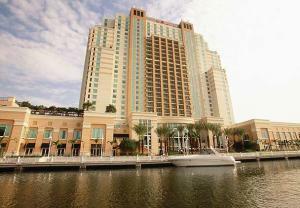 Thats all for now, but stay tuned in for more updates on things to do in Tampa Bay and Tampa Bay hotels!